Can I change the setting so my Galaxy S5 doesn't change long SMS texts into MMS? When I send texts from my Galaxy S5 (US Cellular carrier, if that makes a difference), if the text is longer than 160 characters the phone switches it to a MMS message instead of breaking it into multiple SMS texts. That wouldn't be a problem except my husband has a flip phone yet, so if I send a MMS message, he doesn't get it. Is there any way I can disable this so that I don't have to watch and physically break the text into multiple parts? Wow only 160? Usually, at least in my experience, they don't switch over until 3 or 4 times that. 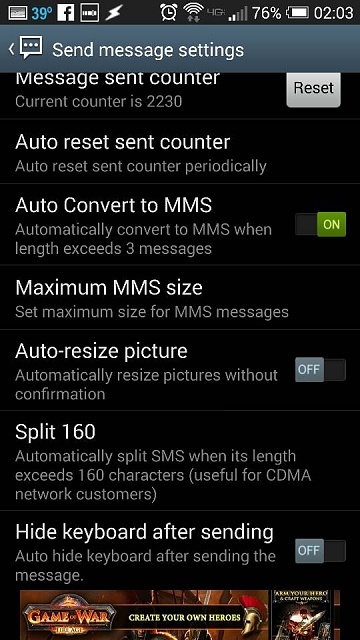 I'm not sure for the stock app or any other apps, but with Handcent there are 2 settings that could affect this, one of them is "Split 160" which splits messages every 160 characters, and two is "Auto Convert to MMS" which converts messages 3x over automatically to MMS. One choice is to replace your messaging app. Note that there is an sms size limit from the end of carrier who will charge for multiple sms if the message is long. VidJunky, SMS is limited to 160 characters (140 octets) by the definition of the protocol itself. The only choices for a message longer than that (even 161 characters) is multiple texts or MMS. It's no more possible to have a single 161 character SMS than it is to have a 40 ounce quart. Laughing Penguin, as ShaQBlogs said, most texting apps give you the choice in Settings of sending long texts as multiple texts or MMS. If yours doesn't, GO SMS Pro (free) is one that does (break texts up On - off is MMS). There are many others in the Play Store. Note above the send button the number 0/3, it counted down from 160 three times, +1, converting to MMS, back to 0/3 and I'm pretty sure that says converting to SMS. People that I text get one long text not 3 separate ones. So maybe you're wrong. If your only options with Go SMS are multiple messages you may want to try Handcent. 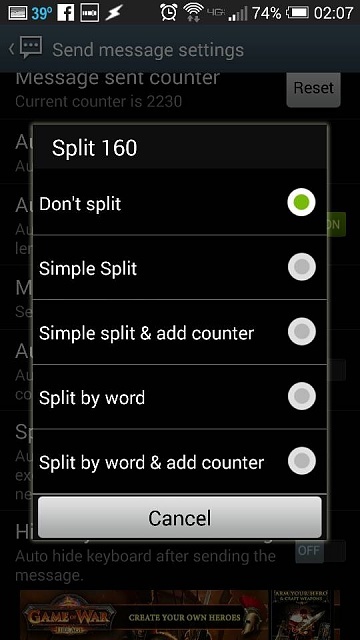 You can see there in the settings that it gives you the option to split at 160 or not to and it also will auto convert to MMS after 3 160 character pages. After. Sorry the app won't allow an additional pic through edit. Note above the send button the number 0/3, it counted down from 160 three times, +1, converting to MMS, back to 0/3 and I'm pretty sure that says converting to SMS. People that I text get one long text not 3 separate ones. Their text app displayed one single text message, the same as it would if it was sent as an MMS - but you can't put 40 ounces in a quart container in this universe, and you can't put more than 140 octets in a 140 octet packet in this universe. Converting a text message to MMS means that a text file is stored on your carrier's MMS server and a link to that file is sent to your recipient. His text app downloads a single text file and displays it. The only thing sent as SMS is the link. (If the link were longer than 160 characters - which no carrier in their right mind would do - the system would send a link to the text file with that long link, which would then be used to download the text file.) It's just not possible to make 160 equal to more than 160. Read 1.2.1 of https://www.ietf.org/rfc/rfc5724.txt That defines what SMS is. Notice that it says "SMS messages have a maximum length of 160 characters (7-bit characters from the GSM character set [SMS-CHAR]), or 140 octets." Can I change or tweak the setting so my Galaxy Note 5 doesn't change long SMS texts into MMS? It does but it doesn't show it to you that way. Many SMS apps will stack messages to make them more viewable. Usually if look to the side of an SMS or sometimes at the top or bottom of the screen, you'll notice a counter it may show something like 124/1 or 143/3. What you're seeing is how many characters remain or have been used in the first section, and how many SMS have been stacked. So in the last example it's showing that you've used 143 characters in the 3rd SMS. So your SMS looks like it's one continuous thread but in reality is 3 threads of 160 characters. In general I think 3 is the magic number but I've had apps that will stack up to 5 before switching to MMS. The person on the other end depending on their app and the carrier from which it was sent, may restack the message and show it as you sent it or it may come in broken up into its smaller SMS packets. How can I free up "App Storage?" Who has the best phone radio reception?